Flooded basements dominate natural hazard damages in many parts of Canada. The cost to lower flood risk varies considerably from several hundred to a few thousand dollars for simple lot-level best management practices, up to many tens of thousands of dollars per home for significant and complex infrastructure upgrades. Cost Benefit Analysis (CBA) can help guide what scale of risk reduction investment is appropriate given the implementation cost and the long term benefits of deferred damages over the lifecycle of the investment. While CBA is uncommon in traditional municipal infrastructure planning, it has been applied in the past to identify municipal flood infrastructure priorities and is now a requirement for large scale projects under the new Disaster Mitigation Adaptation Fund. This blog post explores basement flood cost estimates that may be used to in CBA to help develop flood mitigation strategies and prioritize cost-effective best practices, programs and projects that deliver timely risk reduction. The Insurance Bureau of Canada (IBC) has identified the cost of a flooded basement in Canada to be $40,000 - this has been described as an "average cost". This is an important number in CBA since it drives the value of deferred damages associated with flood risk reduction best practices. A recent report "Blueprints for Action, Minimizing Homeowner Flood Risk in the GTHA"
a $40,000 repair bill on average." and " The average cost of repairing basements damaged by flooding in Alberta and Toronto in 2013 was more than $40,000 for each affected homeowner." citing a CBC news article in which the Intact Centre on Climate Adaptation indicates "The average cost of restoring water-logged basements in Alberta and Toronto in 2013 was more than $40,000 for each homeowner". Correspondence with IBC suggests the value of $40,000 reflects Greater Toronto Area (GTA) costs for 2013 flooding, and not Alberta basements as noted in the Blueprints for Action report, and that values have been 'rounded up'. IBC also noted Intact Centre on Climate Adaptation relies upon US data in Forbes: "More specifically, according to the National Flood Insurance Program in the United States, a 15-centimeter flood in a 2,000-square-foot home is likely to cause about $40,000 in damage” (Flood Insurance: Protection Against Storm Surge. 2012). Let's review this basement damage cost and also consider how it can be used in cost benefit analysis that must take into account the frequency of these damages, that is, the return period or probability of such damages occurring. iv) Intact Centre on Climate Adaptation's presentation to the Standing Senate Committee on Energy, the Environment and Natural Resources Issue No. 38 - Evidence - February 8, 2018 (see transcript) notes "This is very problematic, because the average cost of a flooded basement in the country right now, in urban and rural areas, is about $43,000. ", expanding the damage estimate of "about" $43,000 to include rural areas too. v) Shortly after the Intact Centre on Climate Adaptation appears to firm up the estimate on TVO's The Agenda, Assessing Ontario's Flood Risks, March 23, 2018 (see transcript) and notes "It's highly problematic. The average cost of a flooded basement in Canada right now is $43,000." So the estimate has changed from characterizing Toronto and Alberta flooding in 2013 extreme events to applying to "major cities", then more widely to "urban and rural areas", and has changed from an estimate to a more definitive "average cost" across Canada. How do the flooded basement damage values compare to other sources? increase of nearly 160 percent”. (source)"
Aviva Canada has also commented that average flooded basement costs has increased in a Canadian Underwriter article stating "The average cost per residential water damage claim has increased significantly – going from $11,709 in 2004 to $16,070 in 2014, a 37% increase.". These values may reflect damages in years that did not have widespread record-breaking flood events like 2013, characteristic of more average or typical low-flooding years. "... good practice for property pricing requires that actuaries have the ability to link claims data with detailed exposure data. Thus, actuaries require accurate cause of-loss coding for all property claims. This coding is particularly important following the occurrence of major events such as the Alberta and Toronto floods of 2013. Many losses arising from the Alberta floods, in particular, were covered by insurers as a goodwill measure and to enhance the long-term relationship with customers and not because the peril of water damage was covered in the insureds’ policies." So 2013 damage values include perils that were not covered, e.g., overland flooding. Why else are 2013 claims cited by IBC so high? Because of the severity of the 2013 storm event in the GTA. The chart below shows 3-hour rainfall totals in comparison to return period totals in west Toronto and Mississauga. The Gauge 1, 2 and 3 3-hour rainfall depths of 138 mm, 121 mm and 96 mm were identified by Toronto Water in a ICLR Friday Forum workshop February 19, 2016 entitled 'Reducing flood risk in Toronto' - see slide 19 in the presentation. 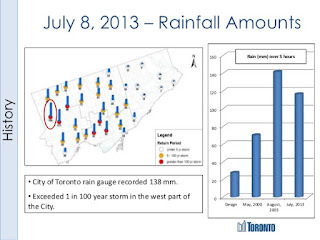 An excerpt from the Toronto Water presentation is shown to the right showing the location of the 3 gauges that recorded over 100-year storm amounts. IDF data for the Toronto City (Bloor Street) gauge are used in the frequency analysis chart above. The version 2.3 datasets with 61 years of record have been extended to include 2017 data obtained from Environment and Climate Change Canada, extending the record to 70 years. Frequency analysis on the extended dataset using a the Gumbel distribution was completed by the City of Markham who uses this gauge in its stormwater management and engineering design guidelines and standards. Frequency analysis was also extended for the Pearson Airport gauge. A summary table showing the updated IDF values, including the 3-hour duration rainfall depths in the chart is shown below. For large portions of the GTA where flooding was concentrated, the observed rainfall amount exceeded the 100-year design rainfall and at two rain gauges even exceeded the 2000-year (not 200, 2000!) rainfall statistic. So 2013 was certainly not an average year for basement flooding. Another reason that the IBC flood damage value may be so high is that it has been vetted by comparing to much larger homes in the US. While the damage for a 2000 square foot home in the US may equate to $40,000, the most flood-prone homes in Canada are much smaller. Most flooding in Canadian cities occurs in older subdivisions build before modern drainage and wastewater servicing design practices, in general, before 1980 - a previous post shows this quantitatively. A Globe and Mail article quotes M Hanson Advisers, a U.S. research firm that caters to institutional investors, indicating "In 1975, the average size of a house in Canada was 1,050 square feet." - this is about half of the comparative house size used to vet the $40,000 damage estimate. The average claim-count-weighted US flood damage is much higher than the Canadian average event claims, perhaps reflecting the severe nature of hurricane event damage as explored in a previous post that evaluated FEMA flood damage payouts - our analysis generated inflation-adjusted claim-count-weighted average payout of $60,600, considering 116 events between 1978 and 2017. So IBC has identified a 'rounded-up' basement flood damage cost associated with a very extreme rainfall event in the GTA and that considers extensive riverine flooding in Alberta where payouts appear to have been for uninsured perils as a means of goodwill and client retention. The Aviva Canada reported average claims suggest a lower water damage amount in average years without the unique 2013 considerations in the GTA and Alberta. What flooded basement damage amount should be considered in deriving deferred damage benefits and in return on investment (ROI) calculations for flood remediation projects? Yes, that was how this post started. Such calculations can take two approaches, one a top-down aggregation approach to guide long-term flood remediation program spending, and another bottom-up property-by-property approach at that recognizes variability in individual property risk. Stay tuned for our economic model of flood damages and remediation strategies!